As y'all know, I love a protein shaker bottle. I'm like a magpie who sees something shiny. My eyes sparkle, a huge grin appears, and my heart goes a little cray-cray. You know, the same kind of feeling you get when you see a dress or trainers you really, really want. Promixx sent me the Original Promixx and upgrade pack to try. NO WORDS. I remember hearing about them a year ago and contemplated buying it but one of the girls told me it was probably a gimmick and talked me out of buying one. Having been sent one now, I am so happy with it. Literally, if the gym is my playground, the Promixx is my new toy, my new accessory. I'll be showing this off when I'm at GymBox in March. Everyone who has used this, raves on about this on Twitter. And no doubt, this is a hundred times better than some of my other protein shake bottles. So, let me walk you through why I am loving the Promixx and why you should get your hands on one. Simple as really. It is a clean design. The Core150 is one of my favourite protein shaker bottles, but because of the amount of liquid it can hold, it is chunky, isn't bag friendly and doesn't fit in the bottle holder of certain cardio machines. The Promixx is much slimmer.The Core150 logo on mine have began to fade away, but I don't think the logo on my Promixx will fade away with age. I know that's pedantic, but hey, just because you've used your bottle a trillion times, you don't want it to look like that. Girls, the Promixx is so much more bag friendly. It feels a lot lighter and you can pull it out of your bag wherever you are, without feeling conscious you're holding a protein shaker bottle. And, if you're not too keen on the colour of mine, the Promixx does come in a cool silver and other colours. But does it blend well bro? I hear you, I hear you. Obviously as a protein shaker bottle, it has to blend in the whey protein, mass builder, BCAAs or whatever you're using. The vortex mixer works like magic. You turn it on for 5-10 seconds, and BAM it's done. No lumps. 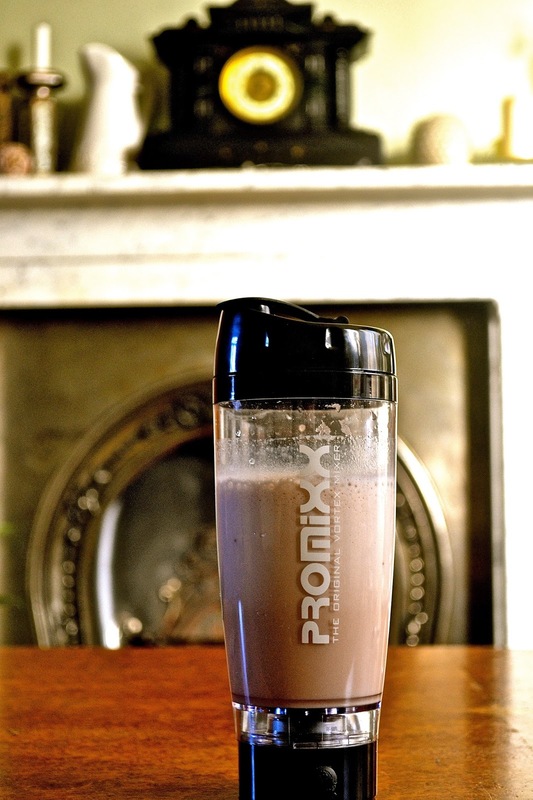 My other protein shaker bottles sometimes leave a miniscule amount of lumps but the Promixx has you covered. Every time I have used this, my protein shakes have been as smooth...as a smooth criminal. I kid you not. The Promixx is magic. Especially after a shoulder or arms workout, you can rest those babies and let the Promixx work its magic. No need to shake away the bottle baby. But I need my intra and post workout drinks, help? The Original Promixx doesn't come with an extra cap, but if you buy the upgrade pack, it comes with the nutripod and lid to store an extra serving of protein powder or the rechargeable motor. You just insert the nutripod into your Promixx where you'd normally put the lid, and voila, done. Simples. The Original Promixx is battery powered but the Promixx team conjured up the next best thing; the upgrade pack. The upgrade pack contains a rechargeable motor so you just detach the other motor (at the bottom of the bottle) and replace. The great thing about the upgraded motor is that you can charge it via USB, whether you're by a computer at your desk or a socket. I love this. Also, the motor is much more powerful and so the vortex is way cooler! If you charge this for an hour, it lasts a month or more. The upgrade pack comes with a USB cable so no need to fret. Will it give me the Lynx Effect bro? Disclaimer: Promixx were amazing and sent me the Original Promixx and upgrade pack to try. Please note, neither Promixx or myself can guarantee the Promixx will give you that Promixx Effect ;). All opinions are honest and my own.